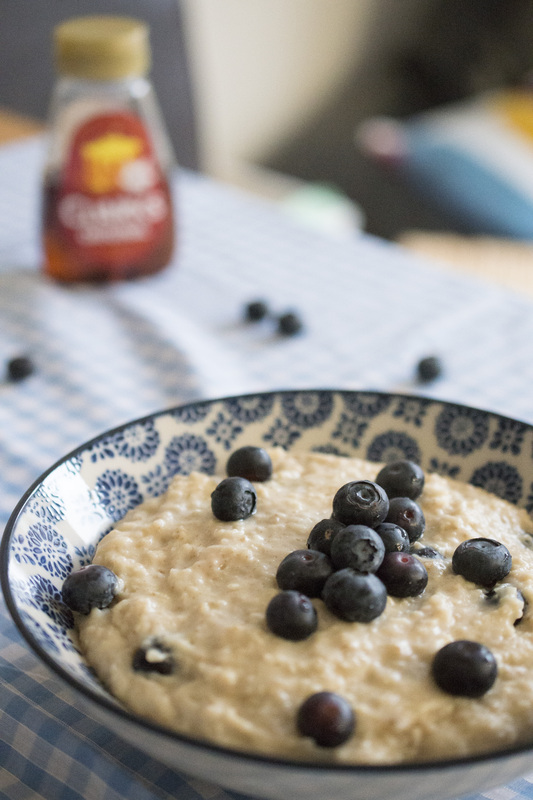 Recently I’ve been experimenting with porridge creating a number of different flavour combinations. The varieties are endless and if you’re a fan there’s lots of elements to enjoy about porridge. It’s warm, comforting and so easy to put together either as a snack between meals or as a main breakfast in the mornings. Here I’ve used blueberries as a topping and sweetened the dish with some maple syrup but you can use any fruit and even substitute the maple syrup for honey if you’re all out! In a small saucepan add the rolled oats along with the milk and water. Place the saucepan over a high heat and once the mixture starts to boil reduce the heat to a medium level. Add the almond butter and stir regularly for 5 minutes until you get a thick, creamy consistency and the oats are soft. Remove from the heat and add the maple syrup and fresh blueberries.